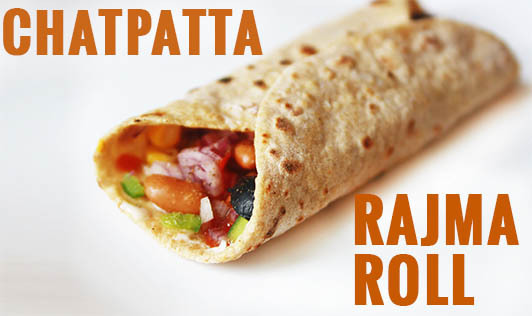 Chatpatta rajma roll is a great snack option for the kids. This recipe is packed with protein and is nutritious and easy to make. • Heat oil in a pan; add chopped ginger, garlic and sauté for a few minutes. • Add chopped onions and cook till golden brown. • Now add coriander and cumin powder, turmeric powder, chilli powder and sauté for a few minutes. • Add boiled rajma, potatoes and capsicum and mix well. • Add tomato ketchup, amchur powder and salt to taste and cook for 5 mins. • Lastly, add freshly chopped coriander and keep aside. • Mix whisked curd, sugar, salt, chilli and spring onion together to make the spread. • Warm the chapattis with little oil or butter on a tawa. • Spread the dressing on the chapatti and place a tbsp full of stuffing on it. • Roll it and serve hot.